Thanksgiving dinners are studies in brown and white: brown turkey, brown dressing, white potatoes, brown gravy, white rolls, brown fried onions on green beans, white marshmallows on sweet potatoes. Even the pies are brown: dark brown pecan pie, beige apple pie, burnt sienna pumpkin pie, all topped with dollops of white whipped cream. Cranberry sauce can be the only vivid color on the table. This year we decided to opt out of brown and white, and instead made a rainbow of colorful food, the brighter, the better. Orange sweet potatoes roasted in the oven with rosemary and garlic, blood red prime rib roasted at 200°F to retain its color, green beans sautéed with shallots, green lettuces and red radicchio dressed with aged balsamic vinegar and best quality olive oil. For dessert we had yellow Meyer lemon frozen yogurt topped with fresh deep fresh blueberries. No one missed our traditional Thanksgiving dinner. The best part about the meal is how easy it was to make. The dishes were straightforward and simple. Without complex sauces, or the need to brine a bird too big for its own good, we spent our Thanksgiving enjoying each other. Instead of stressing over getting the turkey in early enough, or whether it would dry out, or prepping ingredients for convoluted recipes, we sat by the fire counting our blessings and reminiscing about our families. I churned the frozen yogurt during the 3 1/2 hours it took the roast to reach 130°F. When it was done, the prime rib rested for 20 minutes while I finished the meal. Since all the ingredients were trimmed and washed ahead of time, this was plenty of time to make salad, green beans with shallots, and roasted sweet potatoes. The Meyer lemon frozen yogurt was a particular treat. Seven years ago, my husband’s brother and his wife planted a Meyer lemon tree in their South Carolina yard. This year, the tree had a profusion of lemons. My mother-in-law packed four of the surprisingly large, tree-ripened lemons and shipped them to Alaska. 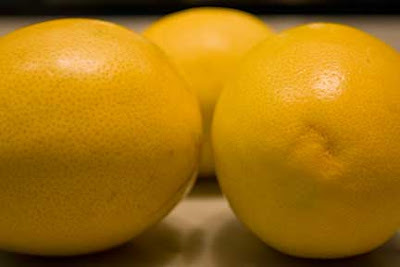 Meyer lemons I’ve seen in the past have been smaller than regular lemons; these were so large I doubted their pedigree. The largest of the lemons weighed one half pound. We cut one of the Meyer lemons to squeeze over fresh halibut. It was heavy with juice, and had the characteristic sweet-scented flavor of mandarin and lemon that complimented, but did not overpower, the halibut. With the remaining three lemons, I wanted to make something special. When I read Lucy's recipe for frozen lemon yogurt on Nourish Me, I found an ideal use for the Meyer lemons -- and my Thanksgiving dessert. 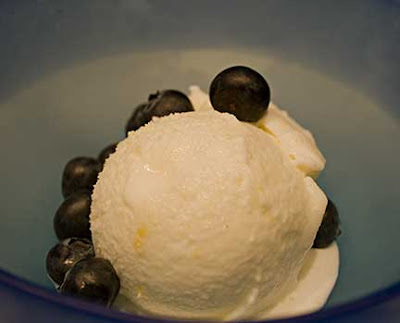 Frozen Lemon Yogurt showcases the complex flavors of Meyer lemon, and contrasts nicely with fresh ripe blueberries. It is light, slightly tart, and a terrific end to a filling meal. I prefer using small garnet “yams” for this dish. Slice the sweet potatoes 1/8” thick. Toss with rosemary, garlic, salt, and sufficient olive oil to coat the potato slices. Spread out in a single layer on a rimmed baking sheet. Roast for 10 – 15 minutes, or until the potatoes are cooked through and the edges are starting to turn dark brown. Adapted from a recipe by Lucy at Nourish Me. This makes 1 quart of ice cream. If you don’t have a food processor, you can mix it by hand. If you do mix by hand, make sure to grate the lemon peel as finely as possible and to fully dissolve the sugar before pouring the mixture into the ice cream maker. Process the sugar and Meyer lemon peel in a food processor until the peel is very fine. Add the remaining ingredients, except the blueberries, and process until the mixture is smooth. Freeze the mixture in your ice cream maker, according to the manufacturer’s instructions. Scoop into bowls and top with fresh blueberries. This is my entry for Antioxidant Rich-Foods/5 a Day Tuesday hosted by Sweetnicks. There are times when I wish we celebrated Thanksgiving. Like right now - gorgeous garnet yams. So very pleased that you liked it, Laurie. The lemons are pretty; the sweet potatoes sounds lovely; the frozen yogurt looks delectable...but my mind just caught on that rare prime rib.....WOW, that sounds good! Mmmm Lucy, garnet yams are SO good. Thanks again for the frozen yogurt recipe -- we are still enjoying it. Katiez, you picked up on a true treat, prime rib cooked low and slow is so very good. The one thing you need to do is season and sear the top crust of the meat, so that is nice and brown. If you don't brown it first, it comes out of the oven looking scarily raw and not very appetizing. You really need a meat thermometer so that you know when the meat has reached temperature (for me, as I said in the post, it's 130F) -- since the meat doesn't really change colors, you can't just eyeball doneness. Sounds like you had an incredible Thanksgiving. I love Meyer lemons.In anything. This looks delicious and will be a wnner in my family - we love everything with lemon! Prime rib instead of turkey! How radical! It sounds delicious and beautiful!! I especially like your sweet potato idea of slicing rather than cubing the way we do. I bet rosemary is wonderful with them. If your mother-in-law sends any more lemons, do preserve one of them (with salt and lemon juice) to serve with couscous or rice. P.S. Patricia Wells has a recipe for preserved lemons in her cookbook "At Home in Provence". Here is our take on her recipe. I'm with you Maryann, Meyer lemons are always good. And the frozen yogurt made with it seems to be getting better with each passing day. The texture is perfect, and can easily be scooped out of its container. I had some yesterday with pomegranate seeds, which I bought after being inspired by your blog. Thanks! ronnell, thanks for stopping by, and I'm so glad you enjoyed your visit! ejm, I love preserved lemons and make them a lot (although I don't think I'd preserve Meyer lemons -- I get them too rarely and they taste so good fresh). 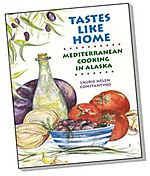 I've always used Paula Wolfert's recipe, but I'll check out how Patricia Wells does them, as I find her recipes to generally be very reliable. And yes, rosemary and sweet potatoes go together very very well. Thanks for stopping by.